Home page > Welcome ! français : Pourquoi observer les étoiles Be ? Be stars are very specific objects to observe in spectroscopy, for several reasons. They are very active stars, which make them great laboratories for stellar physics models. They are not fully understood, despite the huge effort made by the community these last years. Be stars are quite common in the sky, and they are targets of choice for amateurs: they are bright, easy to observe all over the world, and a significant part of them is evolving fast, from hours to years. From time to time, Be stars show an "outburst". This is a hydorgen ejection that change the spectroscopic Balmer lines from absorption to emission. Here is an example (QR Vul outburst between Sept. 2007 and Aug. 2008): We want to better understand the reason for these sudden ejections. Several hypothesis exist, but multiple phenomena are involved (non-radial pulsation, magnetic field, circulation of material, high speed rotation...). and it is highly probable that each Be star has its own combination of phenmena. This is why observing a high number of stars is needed. Be stars observations by amateurs is a useful program for improving our knowledge about stellar physics: amateur can make observations that professionnal cannot ! Observing some hudreds of stars on a regular basis is not accessible to pros in today’s world; it is to amateurs ! The ArasBeam website has been launched in Feb 2007. It has been created by a group of amateurs, in collaboration with LESIA team (Observatoire de Paris) and the BeSS database. The goal of ArasBeam is to coordinate the amateur’s Be spectroscopic observations, in order to have the best coverage in time & stars. This is a friendly tool, simple & easy to use, which can help you to quickly prepare an observing session. The main objective for ArasBeAm program is to detect and track outbursts. We also want to record any short, mid and long term evolutions in Belmer lines profile - mainly Ha. 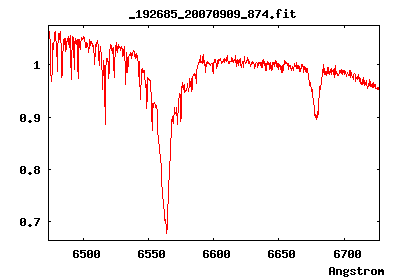 More and more spectra made by amateurs are made with low resolution spectroscopes. This allow to change our observation strategy, using low resolution to detect outbursts, and high resolution to track them. BeSS is a professional tool that is administrated by LESIA team. 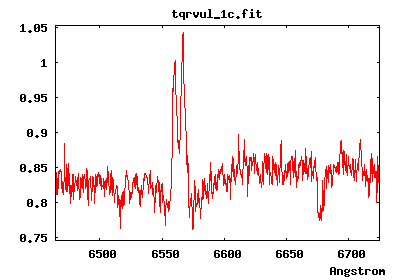 Several amateurs are validators for amateur spectra. BeSS updates ArasBeam database every night, to ensure up-to-date data. In green, the stars that have been observed recently (or for less than the expected observation period). These stars are not strictly required to be observed. In yellow, the stars that have been observed for more than 80% of the expected period. This is time to observe them again ! In red, the stars that overpassed the expected period : it is urgent to observe them again ! In purple, we indicate some stars which require intensive observations, either beacause they are part of a specific program, or because they have been discovered in outburst recently. If you click on a star, you’ll get a new page with all the spectra recorded for this star. They are sorted by date : the most recent is the first shown. ArasBeam is a tool for amateurs, developped and administrated by amateurs. Of course, this is an evolving tool, and we are very open to all your comments to improve it. We hope you’ll enjoy using ArasBeam, and it will engage you to observe Be stars - which are wonderful objects !